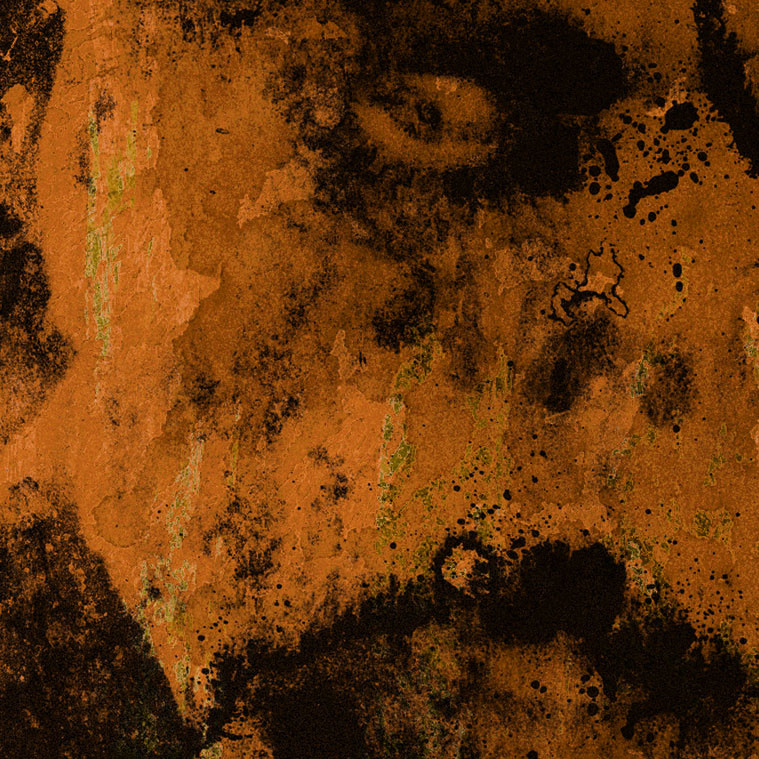 If you've been soaking up much of the extreme black/death metal that has surfaced in recent years, you've seen the visual work of Industrie Chimere Noire. This Québécois designer (aka Joce) has been behind the distinctive and imaginative album design and artwork for a host of hideous, hellish death metal, black metal, and extreme industrial bands, including the likes of Abyssal, Portal, Fistula, Hooded Menace, Morne, Nekrasov, Unearthly Trance, and Utlagr, among others. 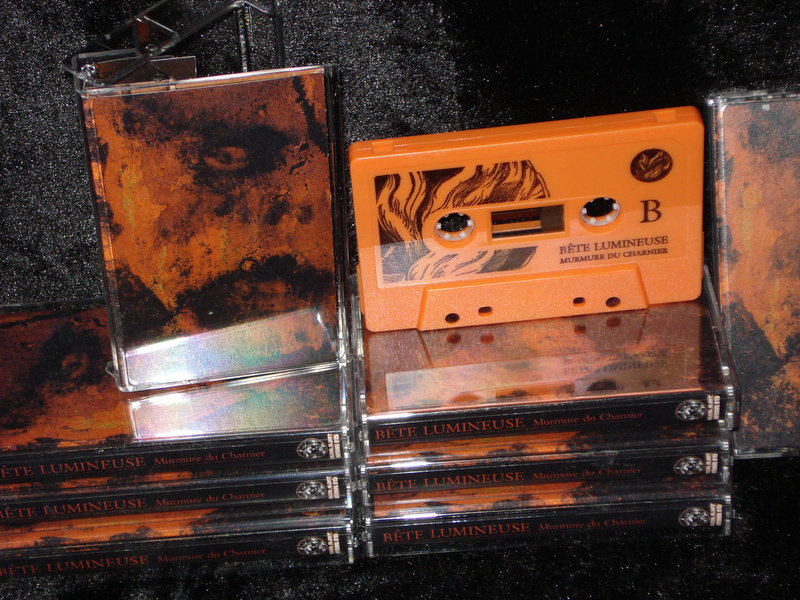 Beyond his visual art and design, though, Joce has also been creating sinister, spectral music of his own with his solo project Bête Lumineuse, which has to date released a handful of split tapes with bands like Actuary, Lortie and Neige Et Noirceur. Practicing a kind of nightmarish kosmische sorcery, Bête Lumineuse's sound is surreal and suffocating, centered around brackish dronescapes and drifting fogbanks of mesmeric murk that often resemble the sound of some particularly baleful 70's-era space music cassette (think Tangerine Dream circa Zeit) that has just been dug up after being buried deep beneath a forest floor for the past ten years. After that series of splits, Bête Lumineuse has resurfaced with his first full-length cassette, Murmure du Charnier. A half-hour excursion into phantasmagorical black holes and charnel-house ambience, featuring ten tracks formed from the warped howl of mutated synthesizers that have been tortured into monstrous ectoplasmic deformations, and layers of black industrial rot. The tape opens with the crushing cosmic synthesizer roar that briefly blasts across the beginning of "Entree", the voices of ancient magicians echoing beneath the grinding electronic drones. From there, the album drifts into vast murky dronescapes filled with low subterranean rumbling and ghostly voices that waft across the background, smears of choral sound stretched into infinite, terrible howling across the nuclear-red horizon, the sound shifting from shorter passages of minimal distorted synthdrone to more atmospheric dark ambience like the ghastly murk that spreads throughout "Voix Dans Les Murs". As the album's minimal rumbling synths and meditative electronics unfold, you can hear where Bête Lumineuse is drawing some of its influence from the darkest recesses of early 1970's experimental space music. It's persistently creepy, though, with huge washes of unearthly EVP-like sound that comes barreling out of the blackness, horrific screams and eerie angelic chorales muffled and muted and melted down into a thick, swirling murk, like a more blackened, morbid take on Yen Pox's early dark ambient soundscapes. Fragments of romantic symphonic music will occasionally bleed through the rumbling black drift, pieces of nostalgic melody that briefly materialize before being swallowed back up by the cavernous darkness, while pieces like "Possession Hypnotique" descend into more surrealistic realms, throbbing rhythms undulating beneath weird mewling tones, bizarre spacey effects and those densely layered drones. "Cosmos I: Pulsar Mourant" pushes that classic Zeit-era sound all the way into the abyss, and immense bass drones pulsate through the cacophonous roar of "Vision Trouble", thundering above strange processed voices lost in necromantic reverie as the track slowly evolves into an almost power electronics-style assault. Towards the end, "Combustion Spontanee" blossoms into a nightmare of anguished cries, scorching feedback and delirious noise , an infernal noisescape that shares some of the hallucinatory mausoleum atmosphere of T.O.M.B., testimonials of clandestine psy-ops activities descending into squirming synthesizer noise. "412 Yeux Qui Hurlent" is a short collaboration with Montreal power electronics artist Lortie that unleashes a throbbing industrial blast of rhythmic noise and looping drones and corrosive distorted buzz, and eventually dissolves into the final stretch of dark, dreamlike ritualistic ambience that closes the tape with "Sortie". Released in a limited edition of two hundred copies as part of the Infernal Machines series, Murmure du Charnier comes on pro-manufactured cassette and includes a digital download code for the album.